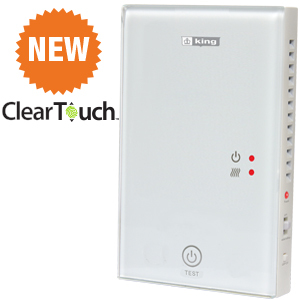 Wifi enabled thermostat with smart phone app. 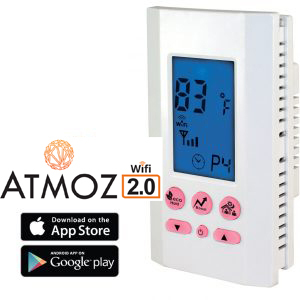 Programmable with Atmoz Android and iOS App. Control is always in the palm of your hand. 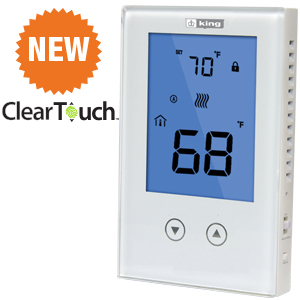 Bluetooth enabled thermostat with smart phone app. 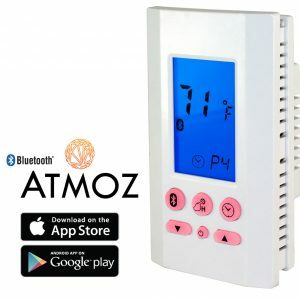 Programmable with Atmoz Android and iOS App. No programming needed. 3 personalized presets. Oversized buttons. Providing highly accurate temperature control of line voltage electric heaters. Compatible with the K312RELAY for heating applications exceeding 15A. Links with K302PE & K322E to provide single control of larger heated areas when load exceeds 15A. 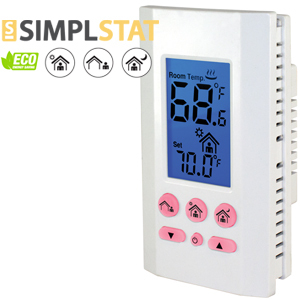 Receives signal sent by master thermostat & activates heat when required. Ideal for building managers. Tenant sets room temp. After 2 hrs automatically sets back to 62ºF. After 48 hours of inactivity it sets back to 55ºF. Use where high accuracy is desired, and programmability is not needed. Large back-lit display. 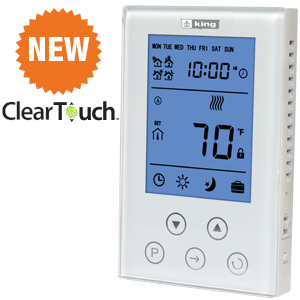 Seven individual day programmability; four time and temperature settings. 3 wire, line powered. Large back-lit display. 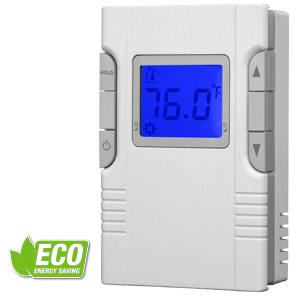 Designed to be used when 2 independent heating circuits are needed for heating one large room. Programmable. Designed to reinforce positive energy habits while limiting landlord energy expenses. 7 day programmable. Designed to reinforce positive energy habits while limiting landlord energy expenses. Non Programmable. 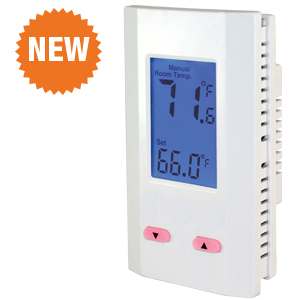 The K101 thermostat has a larger, more sensitive, bi-metal sensor that improves temperature accuracy to +3° F.
The K102 thermostat has a larger, more sensitive, bi-metal sensor that improves temperature accuracy to +3° F.
The K101-C thermostat has a larger, more sensitive, bi-metal sensor that improves temperature accuracy to +3° F.